Standard Stretchers are our light duty range of stretcher bars, but we still manufacture the bars out of laminated pine for complete stability. 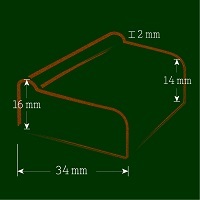 The profile is 34mm by 16mm deep. These bars start at 8 inches long, and are sold in even inch sizes up to 36 inches long. Due to their light weight we cannot make them longer. The front of the bars has a small 2mm lip to lift the canvas away from the edge of the bar. Standard stretcher bars are not available with cross-bars. All bars are supplied with wooden wedges.